The black rat snake is a long, dark-colored snake with a white chin and throat. These snakes generally range from 40 inches to 70 inches. Except for its chin and throat, the black rat snake is dark over most of its body, although faint blotchy patterns are often visible. Young rat snakes are gray with dark blotches. The black rat snake makes a rattling sound with its tail when threatened. Black rat snakes mate in spring. The female lays about 12 eggs toward the end of summer. The babies are about 12 inches long when they hatch in autumn. 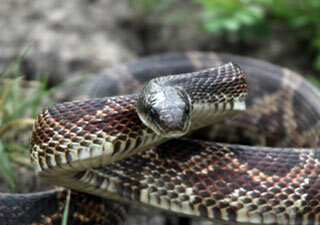 In Minnesota, this snake is only found in forests of the southeastern part of the state. They are active during the daytime.